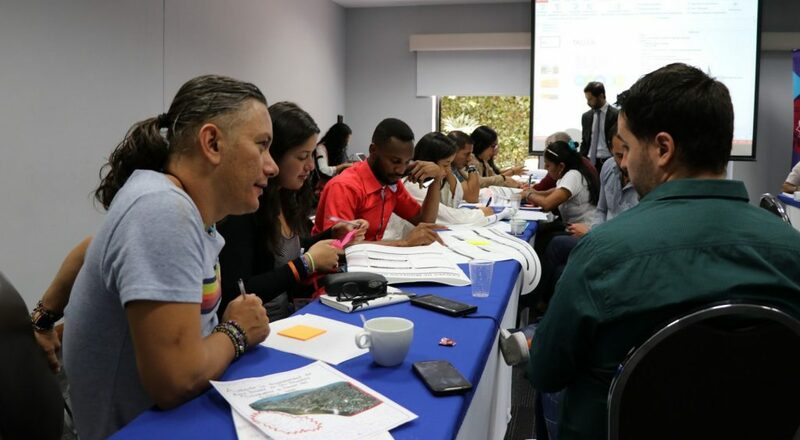 During four days, in the city of Bogotá, 25 RECON social entrepreneurs from different regions of the country participated in the second day of training for social ventures: “Strengthening the business model”. In this space they received training in various topics such as: digital tools, business model, canvas analysis, market research, identification of competitive advantages, price definition, promotion, market and product and market measurement, with the purpose of helping them achieve profitability and sustainability. The workshops were facilitated by Impact Hub Bogotá, Athena and El Lab Coworking Cali. Within the framework of the training day, RECON signed two strategic alliances, one with AEISEC to bring foreign students into internships in Colombia, so that they contribute to strengthening social entrepreneurship from different areas of knowledge and another with Impact Hub Bogotá and Athena for the creation of regional training days that bring tools to strengthen the business model of social enterprises. Natalia Ordóñez of Get Up and Go Colombia of Popayán, Cauca, said that “we learned to analyze who our competition is and what our market is, to identify what makes my project different, to organize all my market strategy to make a difference”. Jully Orozco of a Green Drop of Life, from Usiacurí, Atlántico, reflected on the mistakes made by social entrepreneurs with accounting and administrative issues due to ignorance. Nevis Cadenas, of Frutichar in El Charco, Nariño, indicated that the project had stopped, but thanks to RECON they had reactivated it and are working for its growth.